The best log splitter to split logs real good. If you are tired of spending hours chopping wood with your axe and you are now looking for the best log splitter you have found yourself on the right page! 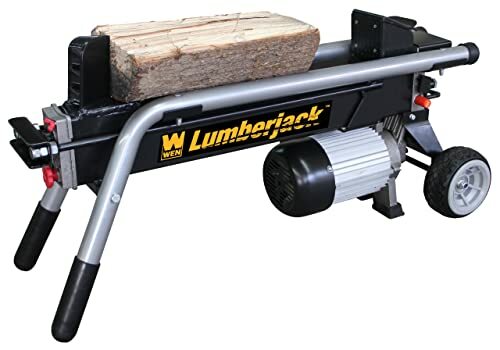 In this article, I am going to discuss all the important aspects of a log splitter that you need to consider when choosing your product. I will also write some detailed log splitter reviews to make life even easier for you. After all, what do we want these days? Quality information quickly! An important consideration is how big you are going to need to go with your machine. If you are not doing a huge amount of heavy duty log splitting then you don’t necessarily need a large machine. You should also bear in mind at this point the kind of wood you are generally splitting because hardwood will need a more powerful machine than softwood. Most people will be sorted with a small-medium machine, but if you are looking to split a lot of large logs with a wide diameter then a heavy-duty machine may well be the best option. Another consideration you need to make is the quantity of logs you need to split. Large volumes will do best with a larger more powerful machine. Then the investment in the cost will be worthwhile. People with medium volumes to split can go for a mid-range option while people with very low volumes can go for a mid-range or budget option. Gas log splitters are going to provide the most powerful log splitting action and will be able to handle logs with a large diameter. The advantage is the extra power to tackle large jobs and a lot of serious log splitting. The disadvantage is the extra maintenance, the higher cost and you will need to buy gas for the product. Not to mention the gas ones will give out fumes and should not be used inside. Electric log splitters are a lot cheaper than the gas ones and can still pack some punch. They will tackle a lot more than a manual splitter or an axe but are not as powerful as their gas-guzzling cousins. The advantage is they are cheaper and still give a lot of power. They can also be used indoors because they don’t produce any fumes. The disadvantage is that they are not the most powerful product on the market and they cannot handle logs with very wide diameters. 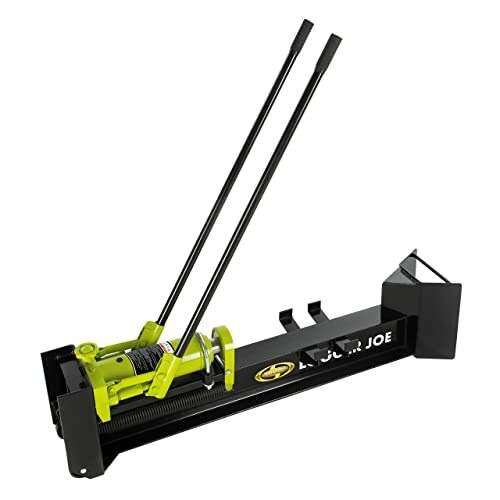 Manual log splitters come in different shapes and sizes and with different mechanisms. Their aim is to make a tiresome job easier without getting too technical and without investing a lot of dollars. The advantage is they are the cheapest options on the market and can still make the job a lot easier (and safer) than with an axe. The disadvantage is they are not the most powerful product on the market and they cannot handle logs with very wide diameter. They are not a solution for people with a serious amount of log splitting to do. Lastly, you need to balance your budget with your needs. A high-powered gas machine is likely to be in the $1000 price range. A mid-range electric product is usually around $300-$500. Then simpler manual systems are around $50-$200. You need to balance the size of the task you have at hand and the amount you want to spend to make that job easier for you. 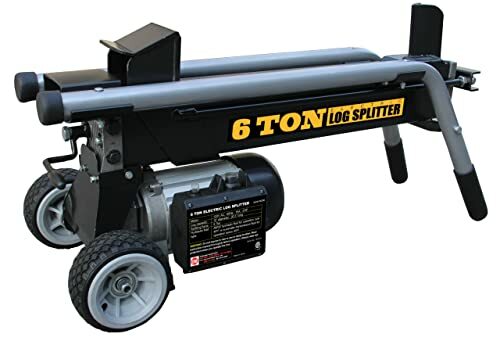 In the reviews of five products below, I have included one gas log splitter for high use (#4), two electric log splitters for medium use (#5 & #2), and two manual log splitters for low use (#1 & #3). Will split logs up to maximum diameter of 8″ diameter and 18″ length. 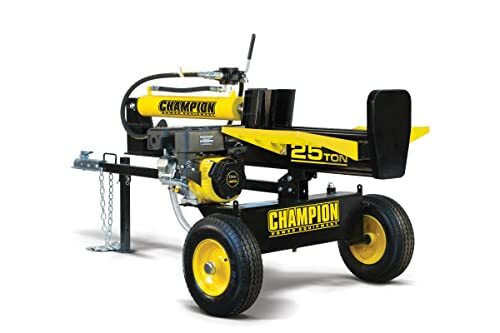 This is a hand operated log splitter and while it will not tackle large logs, for people wanting to make a moderate amount of log splitting easier it will make a very good buy. 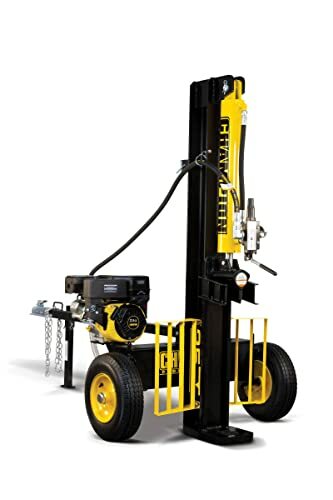 The hydraulic system makes the split easy and manageable and claims to build up to 10 tons of force. Given that the electric log splitters claim 6 and 7 tons this is pretty impressive! There is no engine or electric motor so this makes the maintenance very easy and will suit people who are not very technical. The low end cost reflects the simplicity of the product. The product looks and feels strong and is made of steel for longevity. My main concern would be the cradle of the wood it could do with being a bit more robust in my view. The product comes with a 2-year warranty, which gives some reassurance when the lower price might lead you to think the product is a lower quality. People who have a low budget. 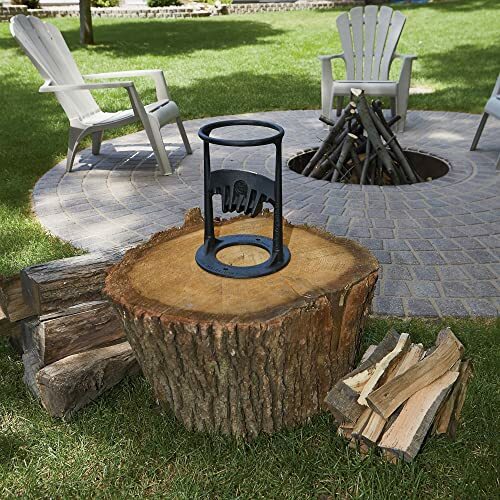 Will split logs up to 10 ” diameter and 20.5″ in length. This is a high quality mid-range product and packs a lot of punch for its size. At 7 tons it is more competitive than #5, which is a similar electric product but with only 6 tons. One of the best things about this product is that it has a special patented design that allows for one-handed use. For those of you who would like the intuitive ease of use this will make a good choice. 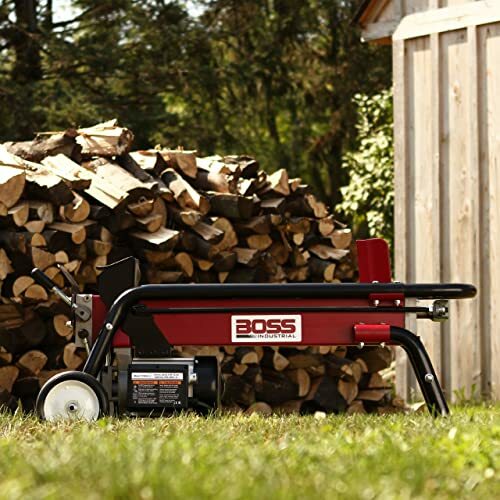 This log splitter is an electrically powered machine. Therefore, it is not the most powerful option on the market. However, the bonus is that it doesn’t output fumes so you can use it indoors and outdoors. There may be some benefit in purchasing the stand for this product so you can split logs at a more comfortable height. The product comes with a 2-year warranty, which gives some reassurance when investing a fair amount of dollars into the purchase. Those of you who have a medium volume of log splitting to do. Not a commercial amount, a serious amount of personal use. Will split logs up to maximum diameter of 16.5″. 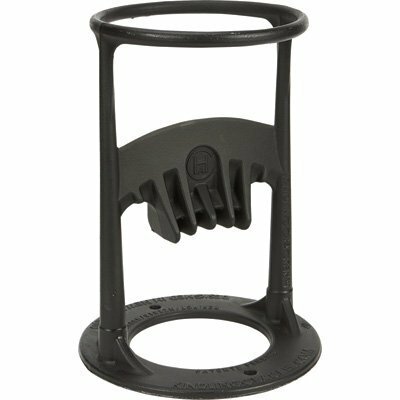 I have included this product because for people who split wood on a small scale for their home fireplace it makes an excellent innovative choice. The product was originally designed as a school project and the aim is to make log splitting easy and safe. There is no need to use a dangerous axe, just a large mallet and the kindling splitter itself. The force you need to split the wood is less than what is needed when splitting wood with an axe. As a low-tech innovation, I think it is great and a excellent way to get the kids safely involved in your work as well. The product is highly popular and has won design awards. 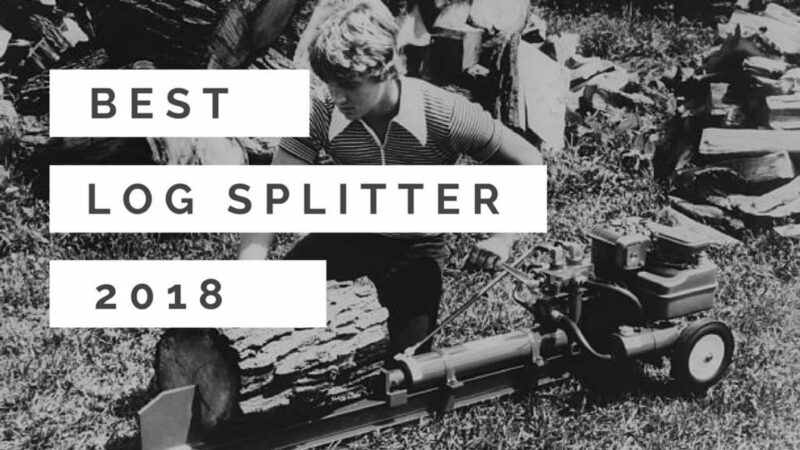 Made in Australia the splitter is sturdy with a compact design, which makes log splitting easier, safer. The log splitter is made of top grade cast iron and made to last. Not to mention the low cost of the product. Along with the low cost, the product comes with a 5-year warranty. 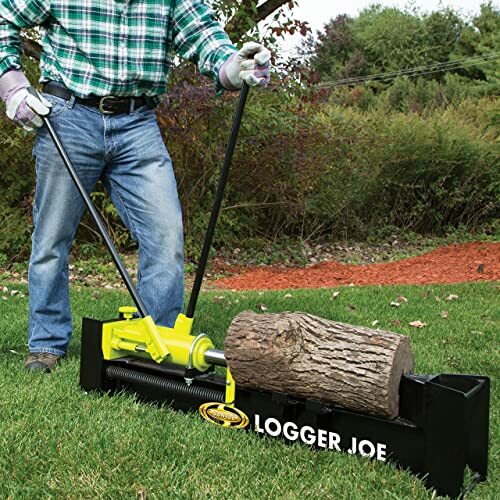 Will split logs up to 100 lbs and 23.8″ in length. If you want serious machinery then this is a log splitter for you. The machine is ready to contend with a serious amount of log splitting and can work fast with a 12 second cycle time if you can keep up with that! The product involves some maintenance and correct use so if you are a handy, technical person you will be able to manage it. This way the product is going to last and perform at its best. If you are reasonably new to this kind of machine a smaller product may be a better choice to start with. One feature I particularly like and I would find very useful at home is the fact you can choose to split the logs vertically or horizontally. In general, I find myself preferring horizontal splitting but there are some circumstances when vertical splitting is better so I really appreciate having the choice! Another useful feature is you can tow the machine, which means if you are taking your log splitter to various locations you can get it on site and back easily. Again, these features are included because the machine is designed for heavy use. The product comes with a 2-year warranty, which gives some reassurance when investing a sizeable sum of dollars into the purchase. Those of you who have a high volume of log splitting to do. This is a powerful machine and a makes a good mid-range option for those people have some serious log splitting to do without being at a commercial level. The cost is pretty good value given the benefits of the product. The pushing plate is 4″ x 4″ so this is a good size to handle pushing the logs. The splitter itself is 4.5″ which gives a good powerful split. The splitter is electric powered, which means it is not the most powerful machine by a long way. However, you can run it indoors and outdoors and it does not generate fumes. As long as you don’t have seriously heavy-duty splitting to do this machine will do well! The splitter is equipped with strong “never flat” wheels that make wheeling the splitter to different locations easy. There is a safety feature with this machine which means you must operate the splitter with two hands. Some people report annoyance with this feature, especially if they are experienced users of this kind of machinery. However, given that most people buying this product will be new to log splitting machinery then I think the feature is a good one. In the end, I think it is more important to be safe even if it is a bit annoying! 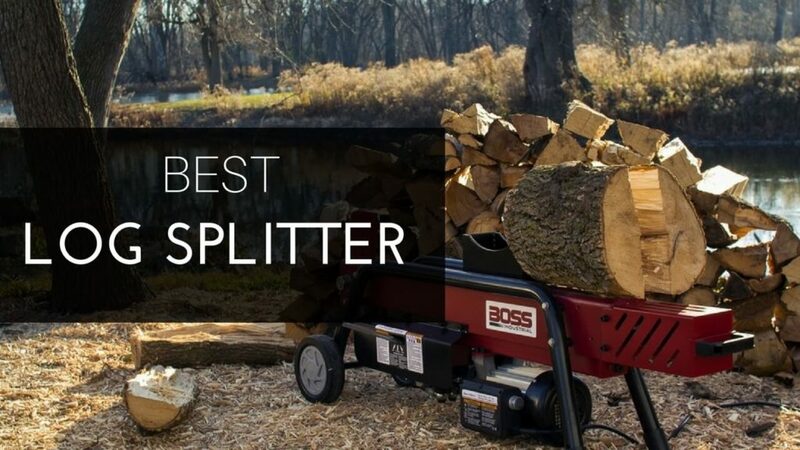 The Best Log Splitter is? My favourite could well be #3 the manual kindling splitter because I think it is an innovative low tech product that will make a tiring job much easier. 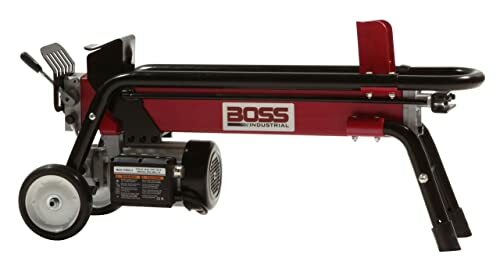 However, if you have some serious log splitting to do without needing a heavy duty product, my favorite is #2 the 7 ton Boss Industrial log splitter. I like #2 best because it is easy to use as well as powerful. I hope I have given you some food for thought and you have a better idea of what you need to look for to choose the best log splitter for your needs. Let us know your thoughts in the comments. Have you used any of these products? Which is your favorite log splitter? Or do you like doing it the old-fashioned way with an axe?